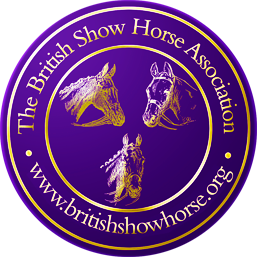 The British Show Horse Association (formerly known as The British Show Hack, Cob and Riding Horse Association - BSHC&RHA) was founded in 1935 by enthusiastic Owners and supporters of show Hacks and Cobs. In 1983 the Association added Riding Horses to its classes and by so doing greatly enlarged its Membership. Today the Association is the governing body for the Showing of Hacks, Cobs, Maxi Cobs, Riding Horses and HOYS Ridden Hunters. It maintains a register of Members and their Horses and a Panel of qualified Judges. The objects of the Association are to improve the standard of show Hacks, Cobs, Maxi Cobs and Riding Horses and encourage their breeding and for Shows to affiliate to the Association, to abide by its Rules and to endeavour to safeguard the interests of Members in every possible way. The Association runs an Annual Assessment Day to examine Candidates applying to join the Judges Panels. Successful Candidates may be accepted on to the Full Panel (this could be for Ride, Conformation or both) either with or without a '*' (a '*' denotes they may judge RIHS and HOYS qualifiers in their own right). There is also a Probationary Judges Scheme which allows for those Candidates which require further training. The Probationary process has proved very successful, it is a two year process but the BSHA works hard to complete this in one year, if at all possible. More details can be found in the Judges area on this website. The BSHA In-Hand Chairman is Sarah Carey, who actively looks to promote the breeding of show horses and increase the numbers of In-Hand showing opportunities. Sarah continues to develop The 'BSHA Martin Wood Supreme In-Hand Breeding Championship', sponsored by Martin Wood; qualifiers around the country culminate in a Supreme Championship with £1000 to the winner, this is held at the BSHA National Championship Show in September at Addington. Social events such as luncheons, seminars and teach-ins are organised throughout the year and the Association runs its very popular National Championship Show at the end of the Summer. This features many additional classes such as the Best Trained, Pairs, Working Show Horse, Grand Prix Working Show Horse, Side Saddle, BSHA Grass Roots Championship and much more. In 2008 the Maxi Cob was introduced and has proved very popular. In 2009 qualifiers were introduced for the Royal International Horse Show; in 2011 the first Maxi Cob of the Year was to be held at the Horse of the Year Show. The Board is always open to new opportunities and initiatives such as the BSHA Home Counties (inc.Grass Roots) Show, the BSHA/DMSL Phone Systems Ladies Show Horse class etc.